Naturally, both the Moon and the Earth have spherical gravitational fields around them. There is a location in space where the Earth's gravitational pull is equal to, and balanced by, the Moon's gravitational pull. This equilibrium point is known as Earth Moon Lagrange One (EML1)[i]. LiftPort will launch a rocket to EML1 that will carry our Ribbon. This is the only location where a Lunar Elevator of this nature could be constructed and it is vital that we arrive there first, as there are approximately 13 nations with an estimated 30 launch vehicles[ii] that can reach this location. Once this location is secured, we will gently release the Ribbon (pulled down by the Moon's gravity) and secure it to the Moon at Sinus Medii, our landing site at the Lunar equator. The Ribbon is most easily equated to an Elevator cable, however, instead of using an industrial steel line, the Ribbon is very thin, and will be constructed from one of 12 candidate materials which are strong enough to support Lunar Space Elevator Infrastructure (LSEI). Once the Ribbon is secured, we will divide and repurpose the mechanisms and technologies from our faring (the remainder of launch vehicle that put us into orbit and ferried us to EML1) to construct both the foundation of the space station and the counterweight. As we further develop the space station at EML1, we will begin surveying the Moon with rovers to analyze and quantify useful minerals and ice that are on the Lunar surface. The Moon is littered with valuable minerals including KREEP[iii] (Potassium, Rare Earth Elements, and Phosphorus), platinum group metals[iv], titanium[v], and ice[vi]. (picture of titanium?) LiftPort will then begin to utilize the asteroid-beaten surface of the Moon by mining these elements and especially focusing on harvesting Lunar ice. Ice on the Moon is valuable because we can convert it into rocket fuel. By supplying our EML1 Station with rocket fuel, we establish it as the primary fuel depot and shipyard for advanced space missions. Eventually, our LSEI concept is to construct a shipyard where a rocket can fly to, dock, refuel, and take off again. This allows us to have fully fueled rockets taking off with almost no gravity to fight, saving extraordinary levels of energy and money. Destinations can include anywhere in to solar system. In fact, it is energetically cheaper to boost LEO to the Lagrange, refuel, and boost back to GEO, than to go from LEO directly to GEO. Figure 1 - LSEI System Schematic. Includes gravitational fields of both the Earth and the Moon, the LSEI components, and distance details. The Space Shuttle was only designed to go to Low Earth Orbit (LEO). 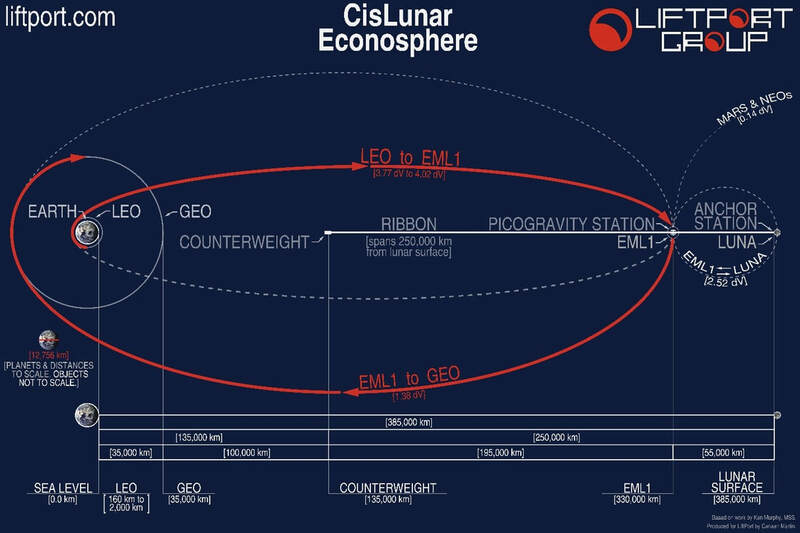 Through LSEI, we want to expand our reach to the Moon, which is ~1000 times as far as LEO. (400km/250miles to LEO[vii] versus 384,000km/240,000 miles to the Moon[viii].) The NASA Space Transportation System program ran for 39 years (design, construction, operations, and shut-down) and cost a total of $196 billion. If the total cost is amortized against the all 135 missions, the average cost of a single shuttle launch is ~$1.450B[ix]. The initial phase of the Lunar Space Elevator Infrastructure is just $800M; this includes a small-scale working Elevator on the Moon, and a very limited docking station at EML1. An additional $800M expands the system to safely ferry people to and from the surface of the Moon – every month – and expands the utility of the Lagrange Station. If another $1B were invested in Lunar-surface mining, ore processing, and to further expand the Ribbon, this would greatly increase throughput and the productive value of the system. Finally, another $5B – totaling $8B spread-out over 20 years – would develop the starter infrastructure to provide the 200 greatest cities on Earth with clean, green, renewable energy. LSEI could eventually power the planet for 1/25th the cost of the entire Space Shuttle program. Additionally, with the more modern, reusable, rockets that would be used in conjunction with LSEI, such as those of SpaceX, Blue Origin, or Stratolaunch, a single launch would only cost ~$50M[x], 1/30th of the cost of the (now retired fleet of) NASA Space Shuttle flight. The reduced cost would increase the frequency of launches - allowing us the capability to launch at least once a month, twice as often as the Space Shuttle program was able to. We would be able to transport five people to the Moon per launch, bringing more people to the Moon as more Lunar infrastructure develops. Compared to the Shuttle, LSEI is 1/30th the cost, 1000 times as far, twice as often – to a destination we haven’t reached in 45 years – the Moon! The space station at EML1 additionally creates a safe and reliable way to access the Moon's surface without the need for retro-rocket soft landings. Currently, any mission to the Moon relies entirely on retro-rockets (and lots of fuel-mass, expensively launched from Earth) to slow down the vessel for a soft landing. If rockets dock to the EML1 space station, then cargo, people, and technology could be ferried along the LSEI Ribbon to and from the surface of the Moon via our robotic “Lifters”. The energy requirements for soft landings have been the primary reason why we have not gone back to the surface of the Moon in over four decades. LSEI provides a new, more efficient means of accessing the Lunar surface, meaning more people can go back and we can begin to open the resource markets and infrastructure development possibilities that exist on the Moon. Once this transportation system is established, it allows for further infrastructure development on the Moon, such as something like the “Moon Village” proposed by the European Space Agency[xi]. Having a base location for the development on the Moon would allow for habitation, research, and mining of Lunar resources and the LSEI would act to transport researched technology and mined materials to and from the Moon. This would also allow for further exploration and research into the Moon itself. The Moon is thought to have been created when a massive asteroid crashed into the Earth[xii], meaning that the Moon and the Earth are inherently similar in composition[xiii]. Therefore, the minerals we find and use here on Earth, are on the Moon as well. Furthermore, the far side of the Moon is valuable real estate for radio telescopes and astronomical interferometry. If we establish radio telescopes on the far side of the Moon, the Moon itself will act as a shield, blocking out radio chatter given off by Earth and therefore increasing our capabilities of viewing and listening to the near universe[xiv]. The ultimate value of the LSEI lies in the permanence of the infrastructure and our ability to develop from it. Currently, one long-term (16-20 year) idea for how the LSEI could be used is as the infrastructure to develop a Space Based Solar Power (SBSP) program[xv]. SBSP will aim to solve the energy crisis by constructing solar panels at the space station at EML1 out of Lunar regolith collected from the Moon and carried up LSEI by Lifters. These solar panels will be miles long and miles wide, and will be made into satellites that will be pushed into Earth's geosynchronous orbit. These Solar Satellites will be able to capture more energy than any solar panel on Earth, as they will not be subject to day-night cycles, seasonal cycles, dust or other debris, as well as having a direct solar light source, unfiltered by an atmosphere. With these Solar Satellites, we could power the largest 200 cities, providing clean, green, limitless energy, for everyone, everywhere, all the time. This is but one innovation that the LSEI allows for and, with time and advancement, surely more progressive and useful innovations of the LSEI will present themselves. [iii] Borg, Lars E., Charles K. Shearer, Yemane Asmerom, and James J. Papike. "Prolonged KREEP magmatism on the Moon indicated by the youngest dated lunar igneous rock." Nature 432, no. 7014 (2004): 209-11. doi:10.1038/nature03070.